Make your way to the V Theater at the Planet Hollywood Resort and Casino for an unusual entertainment experience. 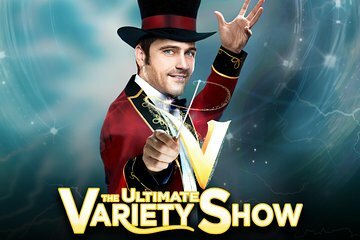 Find your seats for the 75-minute 'V - The Ultimate Variety Show', an entertainment experience unlike anything else on the Las Vegas Strip. Suitable for the entire family, this show features an all-star cast with a unique variety of talents. See a changing roster of acts that include juggling, visual arts, comedy, stunts, magic and special effects. The show changes daily, so you'll never see the same show twice. Today's show could feature a hilarious prop comedian, and tomorrow's show might star an incredible roller skating duo or a contortionist. Choose from a variety of show times and a VIP seating option with guaranteed seats in the first 5 rows. VIP seating includes skip-the-line access and seats in rows E-G; click on View Additional Info for theater seating map. For an all-around experience, choose to include dinner before the show at a nearby Las Vegas restaurant; see Itinerary section below for included restaurants. Pampas Brazilian Grille is a traditional Churrascaria located inside the Miracle Mile Shops at Planet Hollywood. We invite you to enjoy our mountains of garden fresh produce. Then we will then begin our parade of spit roasted meats. Dine at your own pace. Eat as much as you like. Sit back, relax and enjoy! Meal includes unlimited samplings from our side bar which features over 40 hot and cold sides and salads to complete your experience. • Roasted herb chicken served with mashed potatoes and fresh vegetables. • Carved top sirloin with pan gravy served with mashed potatoes and fresh vegetables. • Grilled salmon with malagueta sauce served with mashed potatoes and fresh vegetables. Lombardi's combines the warmth and charm of a European Cafe with the casual character of an Italian Trattoria. Entering the restaurant, the feeling is old world with authentic Italian furniture and fixtures. The open kitchen and the wood-burning oven where signature pizzas are created daily surround Lombardi's dining room. The patio at Lombardi's spills into the cobble stone street of the center allowing the perfect view. Really amazing, especially for someone who does not enjoy shows and being cooped up in a theatre - go and watch it it is really good. Enjoyed this wonderful variety show. Extremely talented cast! Great show! Though the entertainers were not well known, they were very professional. This show is awesome. Great for adults and children. Lots of different acts, something to suit all tastes. Took my 5 year old to this show and she loved it. This show was awesome! Definitely looking forward to coming back to Vegas soon. Didn't expect much from the show as it was quite cheap compared to other show in Vegas ,but it was excellent the compare was very funny and talented,and the rest of the. Acts were brilliant , really enjoyed from start to finish and even had a free photo taken ,can highly recommend . The Ultimate Variety Show was excellent. They had a lot of really good acts. This show was a lot of fun! The comedy parts had me laughing so hard I had tears coming down my face.The stunts were very exciting and thrilling. The only thing I would change is where we sat, front row. We were SO close to the stage, I felt we missed the "entire picture." Sit in the middle or back!